I LOVED this book! It was one of those books that you want to take your time with, to savor. Wendy Higgins is a master with her words. Her characters jump off the page, and her world is so vivid I could imagine the rotting smell of the beast. I really enjoyed Wendy Higgins The Sweet Series, but this book took her to a whole new level for me. In the Kingdom of Lochlanach, a Beast is roaming the land, killing innocent men and boys. The King has tried everything within his power to kill the beast, but nothing has worked and he has lost many of his soldiers, one of whom was very close to the royal family, his niece Wyneth's betrothed. After exhausting all possibilities, the King sends a decree to all of the lands, calling for all of the best hunters to come and try their hand at killing the beast. The prize? The Crown Princess, Aerity's, hand in marriage. The royal family has chosen their partners for years based on love, and this causes an uproar within the castle. Aerity isn't too pleased with it herself, but she knows as the future Queen, it is her duty to do what is best for the land. She only hopes that she can someday love the slayer of the beast. When Aerity meets Paxton, she feels as if she has met her match, as infuriating as he may be. But as she gets to know him, she starts to understand his reasons and she loves him all the more. But with so many hunters heeding the King's call, will he be the one she marries? Aerity was a phenomenal character. She was strong and brave, kindhearted... But she was also human. I loved watching the war raging within her about the Hunt and what it means. She can easily go down as one of my favorite characters. The entire royal family played a role, no matter how small, and their roles were important. The 3 that played the more major roles, Wyneth, Vixie and Ms. Rothschild, were my favorites. They were so different from each other, but you could feel the love the author had for each of these characters with their gentleness, fieryness and strenth. Even the King himself was a character that I enjoyed, and you could feel the pain and heartache radiating from him during his scenes in the book. Paxton and Tiern Seabolt are brothers, who both join the hunt, but they could not be more different. Tiern is lighthearted and fun, while Pax is brooding and always thoughtful. They were each great characters in their own rights. I look forward to learning more about all of these phenomenal characters in the sequel. 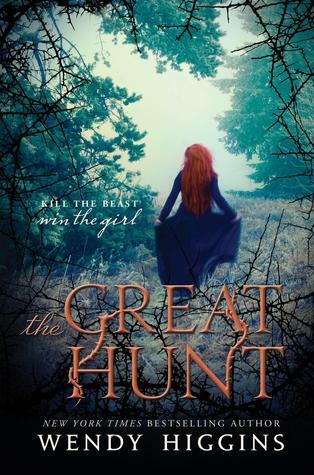 The Great Hunt is a slower-paced story, but that worked perfectly for it. The Beast Hunt was a big part of the story, and these scenes were full of action, and heart stopping moments. But there was just as much focus on Aerity's side of the story, coming to terms with the Hunt and what it would mean, and seeing her relationship with Pax change into something almost wonderful. And spending time with her and her family, just being herself. The ending left me completely heartbroken, but also excited about what is to come in the sequel. I just wish that the wait wasn't so very, very long. This book is an absolute must-read, and cemented Wendy Higgins a place on my favorite authors list. I would not hesitate to recommend this book to every type of reader, teenaged to my age!